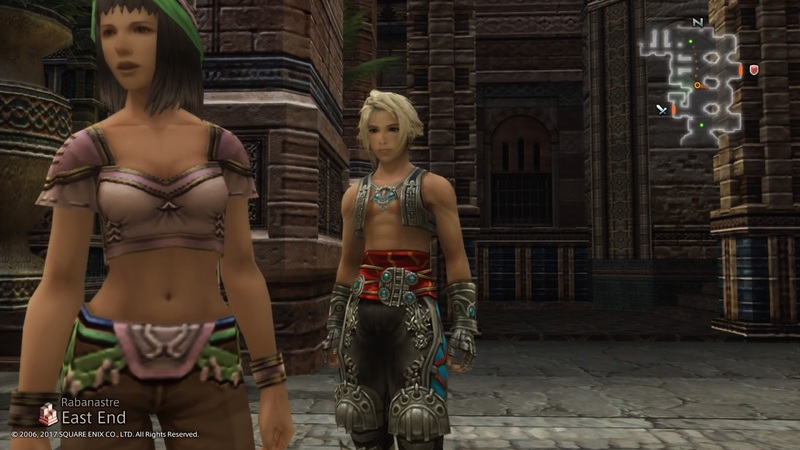 Final Fantasy XII, remastered into glorious HD with Final Fantasy XII: The Zodiac Age, isn’t long away now, and for many people it’ll be the first opportunity to play a game that had been previously restricted to a console that has been long retired. I’ve had the opportunity to have another preview session and get stuck into the game, playing its opening acts in the leadup to the full game. I’d already had the chance to play a couple of select scenes from the mid-game (you can read my thoughts on those bits and pieces here), but this was the first chance I’ve had in around a decade to play through the very start of the game. I’ve come away from my time with the game just as positively as I did from the first hands-on session - this really is my favourite Final Fantasy - but there are a couple of things I wanted to note for people who were either stepping into the game for the first time, or last played it so long ago that they’ve largely forgotten about it. Without giving away spoilers; the first character you control is only for the tutorial, and then you’re put in command of Vaan and, later, Penello. Based on the history of the Final Fantasy series (and JRPGs in general), you would assume that you are in control of important characters here, given that they are the first characters you connect with through the magic of a game controller, but actually that’s not the case at all, and this gives the game an interesting flavour in its first few hours. Again, you won’t play as the tutorial character ever again after that scene’s done, and while Vaan and Penello remain in the core team of characters that you build up, they do become largely peripheral characters in an ensemble cast that does feature far more important heroes. 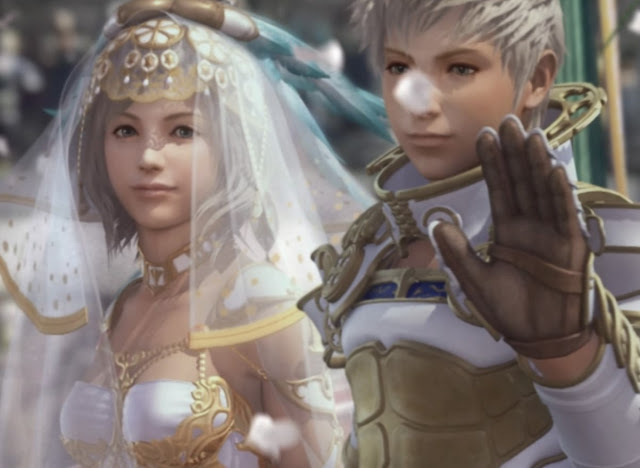 This means, for those first couple of hours of Final Fantasy XII, you’ll feel like you’re playing as fairly bland characters that are rather insignificant to the events that are going on around them. They’re street urchins running the most simple and basic errands for a bit of loose change. It’s like the opening scenes of a play like Romeo & Juliet where neither Romeo nor Juliet bother to show up and the actors that you came to see aren’t on stage - instead some young graduates from acting school are playing bit roles. I’ve seen people argue that Final Fantasy XII has a weak opening as a result of this, but that’s not the case at all. 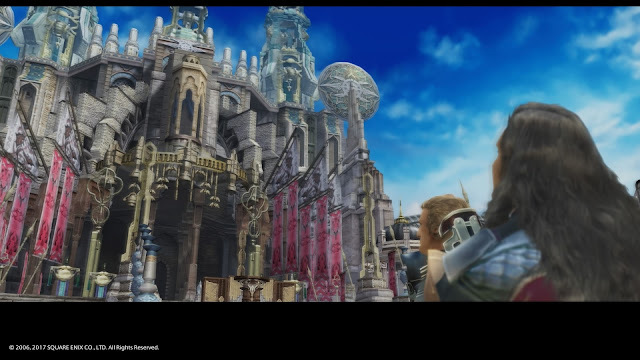 The developers and writers at Square Enix used this opening as a way of setting a scene for a Final Fantasy that no one had seen the likes of before, and in allowing the world and setting itself be the focus before the hard-hitting characters dropped in on the party, the opening to Final Fantasy XII is quite brilliant. My advice is to take your time with it all and really soak up the setting and world around Vaan. That’s where the strength of the first couple of hours of the games rests. Talk to every character, get a flavour for the politics and culture of the city. Don’t worry if you don’t much like Vaan; he’s really not a great character, but some of Final Fantasy’s best are just around the corner. Just don’t be surprised if, three hours in, you’ve completed the opening act and Vaan is about to do something really daring, you’re still not really feeling the character stories as you normally would, instantly, in a Final Fantasy. 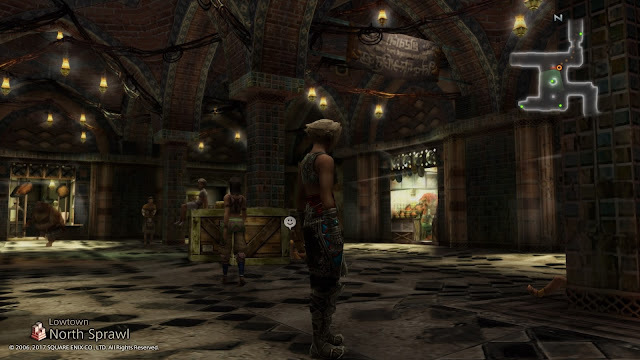 The aesthetics and gameplay flow of Final Fantasy XII are all quite distinct, and it does take a while to get used to it. If the central city that you’ll spend the majority of your first couple of hours play seems exotic, that’s because it’s based loosely on the kinds of aesthetics that we see in 1001 Arabian Nights. From the soaring structures of majesty and wealth to the crumbling underground where the poor are kept out of sight, and the tight, packed bazaars of commerce and trade, it’s a setting that is rarely a major location in either RPGs or JRPGs. It also means that there’s a lot of yellow and golden colours in the architecture, and the surrounding areas look quite barren, as befits a very arid environment. Those expecting lush “graphics” might not be on board with this initially - it looks as dry as it must feel to the inhabitants of the world - but the art direction is quite subtle and gorgeous once you become immersed within the game. Because there’s a lot of errand running, the opening couple of hours can be a little limited in what you can actually see and visit, but Final Fantasy XII does eventually open up to a far greater extent than its single player predecessor (X) and successor (XIII) did. The combat system will also feel very MMO-like at first. Again, have patience with it, because it doesn’t take long to start behaving far more like traditional ATB combat system that we’re used to in our single player Final Fantasies. You can mess around with the speed of the combat system in the options, too, so if you want plenty of time to settle down and carefully plan how you’ll go about fighting enemies, just turn the speed down. Personally I find the combat at its most engaging when it’s on the slowest difficulty setting. Final Fantasy XII comes with both the original recorded score, and a fully re-recorded, orchestral soundtrack. Choose the latter, you’ll thank me for it. Final Fantasy XII’s soundtrack, composed by Hitoshi Sakimoto (and the only numbered Final Fantasy that he has led the music on) is entirely different to anything that you’ve heard from this series before. And it was always good, but now fully orchestrated, it is incredible. The music immediately sets the scene in a deep and nuanced manner, melding perfectly with the aesthetics and narrative to build the impression of a grand, epic setting and world. Subtly exotic, it has a range of different cultural notes, suiting both the semi-1001 Arabian Nights design of the game, and the more traditional Japanese approach to music in RPGs, and it is distinctive, powerful, and fundamentally interesting. Funnily enough, the soundtrack is one of the few Final Fantasy soundtracks I’m not interested in owning in my CD collection, and I don’t play the tracks from FFXII in Theatrhythm that much. That’s not a criticism of the music, though, but rather a reflection of just how masterfully it has been scored to complement and support the action and narrative of Final Fantasy XII. Even within the first couple of hours of play you’ll quickly realise that you’re not paying much attention to Final Fantasy XII’s score, but make no mistake; it is washing over you and subtly immersing you within the majesty of the game’s world. Do yourself a favour and plug in a really good headset if you have one, because this game’s score, now orchestrated, is a solid contender for the best music of 2017. 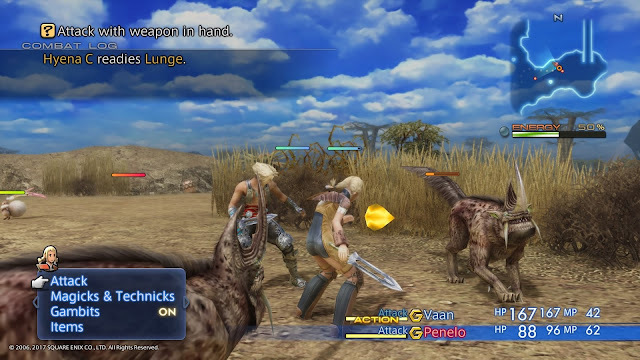 Related reading: On the other PS2 Final Fantasy remaster on PS4 - Final Fantasy X. One final quick note; it’s possible that you’ll come away from your first couple of hours with Final Fantasy XII feeling both a little overwhelmed and underwhelmed. The game has such a spectacular, extended cut scene to kick things off, that when you do start actually playing, it can feel a little muted by comparison. Ironically the game can also feel overwhelming because that opening cut scene is so epic that you just know you’re in for a very long, narrative-driven ride. I know people have given up on Final Fantasy XII in the first couple of hours for either - or both - reasons, and I really recommend you just stick through with it. I truly believe this is the greatest Final Fantasy ever, and that intro, in the context of a complete game that I can’t talk about just yet, is a masterful example of how to set a scene in a JRPG.